The peak gusts of 164 mph led to huge destruction of homes in the built-up area of southern Florida. Total damage costs were $26.5 billion. Hurricane Andrew was the most destructive twentieth century U.S. hurricane. It reached Florida as a category 4 storm where it made landfall at Homestead at 5 A.M. on August 24 with a peak gust of 164 mph. It caused twenty-three deaths in the United States, three more in the Bahamas, and ended up with a damage total of $26.5 billion, of which $1 billion occurred in Louisiana. The vast majority of the damage in Florida was due to the winds. This most destructive hurricane started modestly as a tropical wave that emerged from the west coast of Africa on August 14. The wave spawned a tropical depression on August 16, which became Tropical Storm Andrew the next day. Further development was slow, as the west-northwestward moving Andrew encountered an unfavorable upper-level trough. Indeed, the storm almost dissipated on August 20 due to vertical wind shear. By August 21, Andrew was midway between Bermuda and Puerto Rico and turning westward into a more favorable environment. Rapid strengthening occurred, with Andrew reaching hurricane strength on August 22 and category 4 status on August 24 when it made landfall in Florida. Florida is no stranger to hurricanes and throughout the twentieth century, again and again, the frequency and strength of the storms that arrived led to the waxing and waning of its attractiveness to northerners who wanted to enjoy its warmer temperatures. In the forty years from 1926 to 1966, Miami was hit with hurricanes about thirteen times but from the quarter century 1966 to 1992 there were none and during that period of time people flocked to Miami, doubling its population. New subdivisions sprung up but supervision of building codes and other regulations was lax. There were fewer than twenty building inspectors for a population of one million. The sudden arrival of Andrew was a great shock. Its fierce winds caused most of the damage. Houses were torn apart, cars lifted off the streets, and trees uprooted. Boarding up their windows proved useless as a protection in the face of the wind and very few homes had basements where people could shelter. It was an almost total destruction of whole subdivisions. Reports from private barometers helped establish that Andrew’s central pressure at landfall in Homestead, Florida, was 27.23 inches, which makes it the third most intense hurricane of record to hit the United States. Andrew’s peak winds in south Florida were not directly measured due to the official measuring instruments having been destroyed. A storm surge of seventeen feet was recorded at Homestead. Thereafter the hurricane continued westward into the Gulf of Mexico where it gradually turned northward. 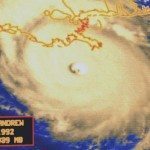 This motion brought Andrew to the central Louisiana coast on August 26 as a category 3 hurricane where the storm surge of eight feet inundated much of the Louisiana coast. It also triggered a killer tornado in southeastern Louisiana. The storm then turned northeastward, eventually merging with a frontal system over the mid-Atlantic on August 28. In all, 63,000 of the residences in Dale County, where Miami is located, were destroyed and another 110,000 damaged. Nine out of every ten mobile homes were also destroyed. Hospitals, fire stations, and other emergency stations had been put out of action by the storm and relief was slow to arrive from other places because there were no telephones or other communications to contact them. Andrew remained the most devastating natural disaster in U.S. history until the arrival of Hurricane Katrina in 2005. The name Andrew was retired in the spring of 1993 and will never again be used for an Atlantic hurricane. It was replaced with Alex in the 1998 season.